Followers of this series of articles on IP rating will recall that a higher number on the 1st numeral will satisfy the requirements of a lower number (i.e. IP6X will mean that it passes all requirements from IP1X to IP6X, revisit here if the reader is interested). It would be prudent to note that such is not the case for the 2nd numeral. An IPX4 test in progress. 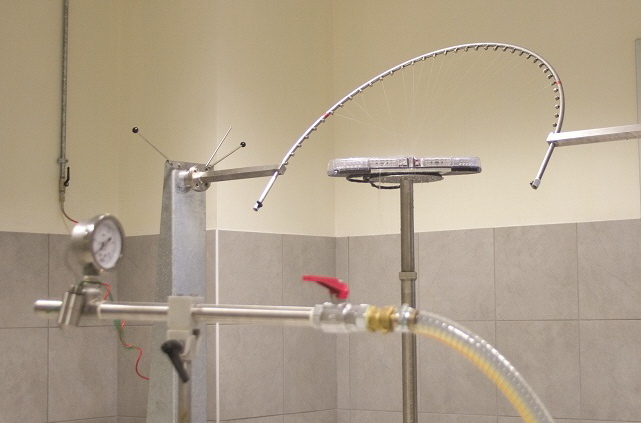 The semicircle apparatus sprays water through tiny nozzles lining the inner circumference. The apparatus is designed such that the water spray will reach the product from all directions. Notice that the spray is constrained to the top of the product, and the bottom is free from its direct effects (image taken from Qualilab). IPX7 and IPX8 requires the product to be immersed in a body of water. In order to understand the test requirements, it is essential to first understand the application of the product in an environment prone to water ingress. Water ingress into the product could come in two different scenario - the product could be sprayed on by water jets, or it could be dropped into a body of water for a determinate period of time. It is possible to be subjected to both scenarios throughout the product's application lifetime as well. A product may be mounted on a motorcycle, for example, and during its lifetime will be subjected to torrential rain as well as water jets sprayed onto it for cleaning purposes. In this case the highest possibility will be a strong jet of water impacting onto the exposed surfaces of the product. There could be certain surfaces that is protected from the direct impact of the water jet due to its position. Such surfaces include the bottom of a casing standing on the ground (the bottom is seated on the ground and water jet could not reach it). A fireman's equipment will always be subjected to strong jets of water during its lifetime, and so would a riot police officer's gear in cases such as the Brussels fireman's union protest in which the protesters (the firemen that is) spray them with strong cold water. In such cases though, the water temperature may play an effect into determining whether water will ingress into the product and damage electronics within (image taken from International Business Times). In other cases, a product may have a high possibility to be subjected to immersion within a body of water during its lifetime. Certain products or installations claiming to work up to a certain depth underwater are one of these. 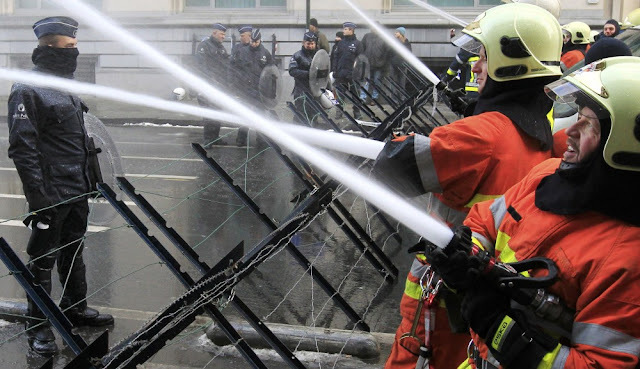 Handheld products that is supposed to be used near bodies of water, such as a coast guard's two-way radio, are another of those examples. Since there are no surfaces that is possibly protected during immersion, as long as the surface is exposed, it will be subjected to the effects of water pressure. The fluid will try its best to work through nooks and crannies of the product to enter the relatively lower pressure interior. Static pressure is exerted in this scenario as water pressure will not change once certain water depth is attained and the product maintained at that depth, hence an unchanged rate of pressure. Of course, the pressure is increasing from the moment the product enters the body of water until it reaches the predetermined depth, but the rate of pressure change is considered relatively low and should not be enough to impact the product's sealing. 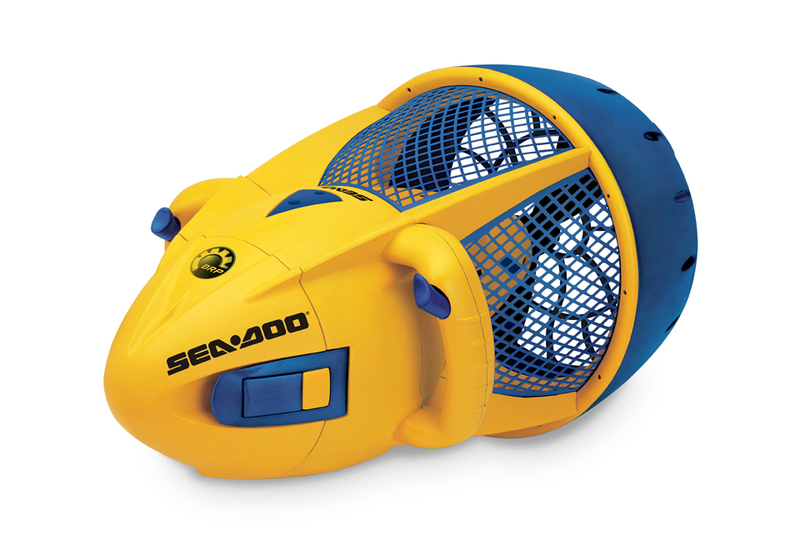 An underwater gear, such as this Underwater Propulsion Scooter, will be subjected to water pressure on all exposed surfaces during its lifetime (image taken from The Sharper Image). The physics affecting both scenarios are vastly different, and as such, a product which meets the immersion requirement (the higher numeral) does not automatically qualifies against the requirements of a water jet requirement (the lower numeral). The fluid dynamics terms of static pressure and dynamic pressure are essential to understanding the effects the products are subjected to. A more direct illustration of how a product which meets an immersion requirement may not meet a water jet requirement can be presented through the example of venting membranes. Most products require air exchange between the interior and the exterior, providing an avenue for hot air to be purged from within. A grill will work in most cases but it is a potential problem for water ingress if the product is subjected to immersion. A venting membrane covering such venting holes is one of the most-used solution, since these membranes allow exchange of air but the surface tension of water halts itself from going past the membrane's surface, sometimes chemically treated to achieve better effect. In other words, the membrane is hydrophobic. In this case, the membrane will protect the product throughout the immersion test. But the effects of surface tension may not be enough if the membrane is subjected to a water jet. In this case water may work past the hydrophobic properties of the material and penetrate through. In most cases, products are labeled to meet both water jet and immersion requirements by stating both IP Ratings. So a product meeting IPX4 and IPX7 will most probably has this label: IPX4/IPX7.